iRobot Scooba Robot Mop $174.99! Half Price Roombas! 2 for $125 Roomba Red; Discovery $120, Scheduler $160! 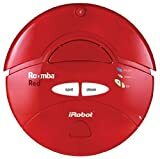 Roomba Red robot vac $79.99! Buy 2 for $135! Best deal ever on a Refurb Roomba Red. $79.99 at Amazon. Add a second Roomba or $45.01 in kitchen and housewares and use $25 off $125 coupon code FALLSAVE. Free shipping and no tax in most states. Today only in Amazon's Friday Sale, Roomba Red (refurb) is $84.99, the lowest price ever. Add $40.01 in Kitchen and Housewares (add the Self-charging dock, for example) and use $25 off $125 coupon code FALLSAVE. That gives you a net Roomba Red robot vacuum price of just $59.99, better than WOOT! Better than Woot! A Roomba for $64.95?! Here's the deal. The Remanufactured Roomba Red is just $89.95 UNTIL MIDNIGHT at Amazon's Friday Sale. Add $36 in kitchen and housewares to use $25 off $125 coupon code AUGSAVER, for a net $64.95 Roomba price.